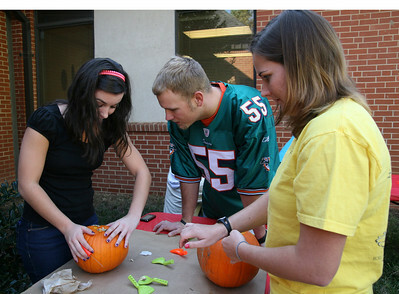 Several students enjoy a pumpkin carving contest sponsored by SGA as part of the 2009 Homecoming festivities. (L-R) Lori Norman (sophomore), Brian Arnold, and Amy Brethauer (sophomore) work on their pumpkin designs during the pumpkin carving contest sponsored by SGA Thursday afternoon as part of the 2009 Homecoming festivities. 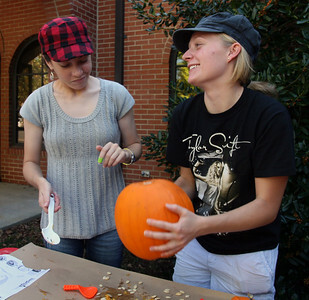 Savanna Yount (sophomore, left) and Brianna Clemmons (freshman) try to decide on a design for their pumpkin during the pumpkin carving contest sponsored by SGA Thursday afternoon as part of the 2009 Homecoming festivities. Justus Hawks (senior, right) concentrates on his carving while Cam Mitchell (sophomore) guts his pumpkin. 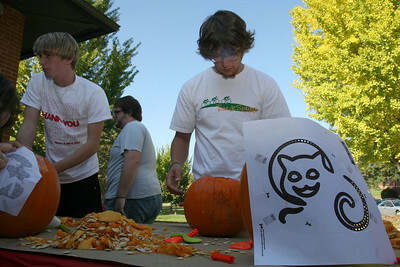 Several students enjoy a pumpkin carving contest sponsored by SGA Thursday afternoon as part of the 2009 Homecoming festivities. Taylor Doolittle (junior) poses with his "headless horseman" design during the pumpkin carving contest sponsored by SGA Thursday afternoon as part of the 2009 Homecoming festivities. 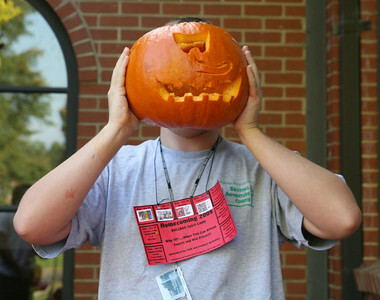 Ruthie Moore (sophomore) poses with a pumpkin designed by Tommy Grassman. 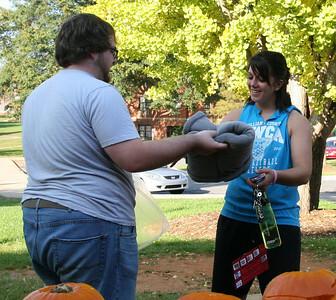 Several students enjoyed a pumpkin carving contest sponsored by SGA Thursday afternoon as part of the 2009 Homecoming festivities. 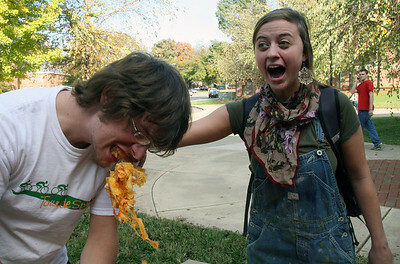 Katie Grace Kibler (sophomore) is shocked as Justus Hawks (senior) actually takes a bite of some pumpkin guts. 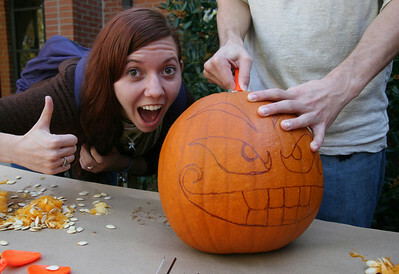 Several students enjoy a pumpkin carving contest sponsored by SGA Thursday afternoon as part of the 2009 Homecoming festivities. 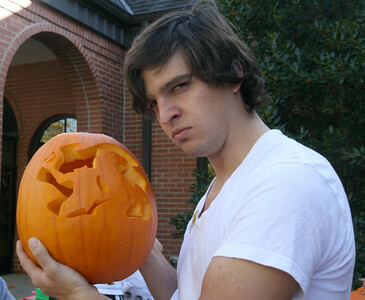 Andrew Slesinger (freshman) poses with his cyclops pumpkin "Gourd" during the pumpkin carving contest sponsored by SGA Thursday afternoon as part of the 2009 Homecoming festivities. 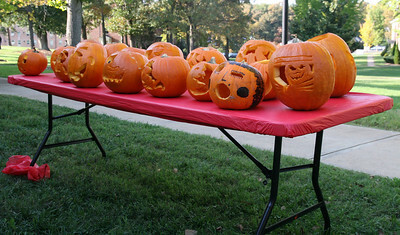 The completed pumpkins wait to be judged during the pumpkin carving contest sponsored by SGA Thursday afternoon as part of the 2009 Homecoming festivities. 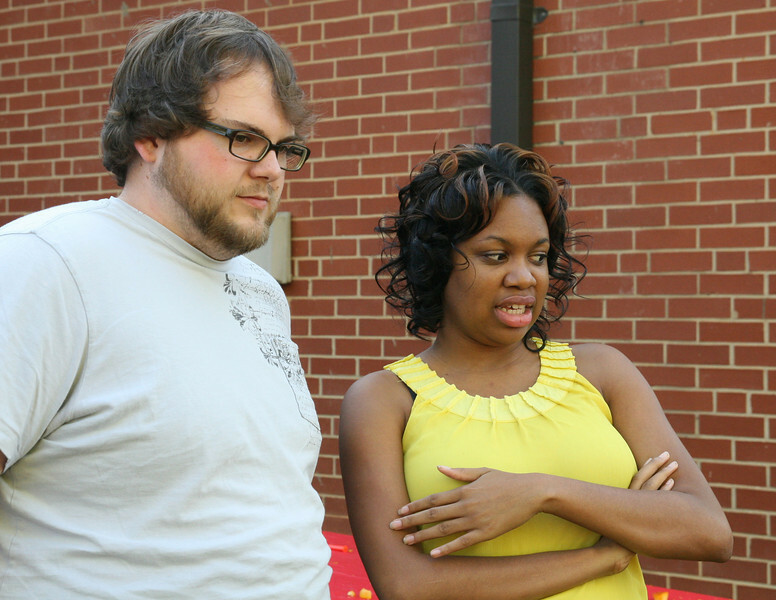 Tyler McCall (senior) and Randi Gill-Sadler (senior) deliberate as they decide the winner of the pumpkin carving contest sponsored by SGA Thursday afternoon as part of the 2009 Homecoming festivities. Brianna Thompson (senior) accepts the first place prize for Best All Around Pumpkin during the pumpkin carving contest sponsored by SGA Thursday afternoon as part of the 2009 Homecoming festivities.